As featured in the world's most widely read Magazines "Dogs World" & "Living with Dogs". 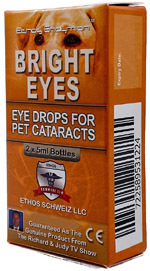 Ethos Bright Eyes Cataract Drops for Pets have been just as effective on pets as they have been on humans. We have loved reading the feedback from delighted owners. Your pet can be healthy, happy and have a much better quality of life just by using these miracle N-Acetyl-Carnosine eye drops which you can easily apply in your own home. Ethos Endymion Bright Eyes is the most advanced eye formulation ever developed and contains lubricants, vitamins and N-Acetyl-Carnosine which is a Powerful Super Antioxidant. Diagnosis of any optical conditions for animals, especially dogs is usually done by a vet or a professional canine ophthalmologist. If you suspect that your pet has an eye problem, Ethosheaven highly recommend a check up as soon as possible before the condition worsens, and then regular eye examinations whilst using the eye drops to monitor the improvement is highly advisable. Many scientists and vets encourage cataract eye drops instead of surgery. To dissolve, cure and prevent cataracts with ethos bright eyes eye drops alongside Ethos Elan Vital for Pets, a healthy diet, regular exercise and other dietary supplements will assist in improving eyesight therefore avoiding the need of invasive and expensive surgical treatment. It is advisable to treat all animals such as dogs, cats, rabbits, horses, kangaroos, etc. in the early stages of eye cataracts. Genuine ethos pet bright eyes drops also have the ability and strength to dissolve and treat mature cataracts to improve vision and the harmful effects of glycosylation often associated with pet degenerative eye diseases. Whilst checking the eyes regularly to see if cataracts or any other serious eye condition is developing in your pet, you should also avoid potential eye irritants such as mid-day sun, chemicals, smoke and dust. We at The Ethos Group are very proud of our eye drop testimonials from very satisfied customers and we look forward to receiving yours. Ethos Bright Eyes Drops will dissolve cataracts without the need for any invasive cataracts surgery. 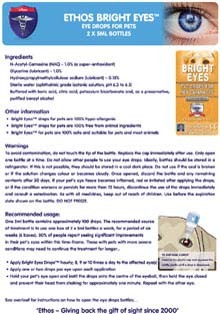 Recommended Usage: - Ethos Bright Eyes Drops for Cataracts in Pets, Dogs, Cats, Horses, Livestock, Reptiles, Mammals and Wildlife. The suggested maintenance use of Ethos Bright Eyes NAC Eye Drops for Animals is to apply 1 to 2 drops in each eye or eyes every day . If the animal has any kind of eye problems such as cataracts, Glaucoma & AMD may want to apply 1 drop several times hourly. Do not exceed over 3-4 Drops in one eye a day in smaller animals and 7-8 drops a day in small dog size and above. Each genuine Ethos Bright Eyes for Pets 5ml bottle should last 30 days at two drops per day or 15 days at four drops per day. A box contains 2 x 5ml sterile sealed proof bottles; therefore each box can last between 30 and 60 days which represent excellent value for money. Unopened bottles should be stored in the dark in the refrigerator out of reach of children. It is also recommended that you take 2 -3 grams of Ethos Elan Vital Supplement in powder form daily that also covers many other health problems. Just as with humans, the age of your pet together with any pre-existing health conditions, will play a factor in how well the Ethos Bright Eyes Drops work. The advice and super foods listed below are known to help fight eye disease, boost energy and maintain good health for dogs and animals with eye problems. We advise you to keep a diary of your pet's daily routines and create tests to do with your pet whilst using the below advice such as throwing a ball a short distance, then a few days later a bit further. This will monitor how they move around furniture and go up and down the stairs. As well as physically looking after your pet, there are also lots of highly nutritious foods that you can give to your pet to improve their general and more specifically, eye health. Meat should be an integral part of their meals mixed with kale, carrots or sweet potatoes. Blueberries and yogurt are great mixed into wet food. There are many simple, fresh and wholesome foods that are easily available which can really boost yours and your pet's wellbeing. The superfoods listed below are known to help fight eye disease and boost energy to maintain good health in general. These antioxidants can have dramatic results on many health conditions by providing food for the brain and body and slowing down the ageing process Be sure to introduce these foods gradually and with the proper proportions, and check with your veterinarian if your pet has any dietary or health concerns. Containing vitamins A, C and E as well as an abundance of antioxidants and detoxifiers to help your dog's eyes, kale is the king of leafy vegetables. To be avoided if your dog has bladder stones or kidney disease. Carrots really can help us see in the dark due to all the fibre, vitamins B, C and K, potassium, phosphorus, magnesium and manganese. And the bonus is that dogs love them! Packed with carotenoids, potassium, calcium, vitamins B and C and of course fibre which ensures a healthy digestive tract, pumpkin is low in calories. If buying the organic canned variety be sure that it has no added sugar and spices. A little known fact is that sweet potatoes contain 150% more antioxidants that blueberries and are rich in beta-carotene. They are also packed with vitamin A and C to keep your pet's heart healthy and immune system strong. Oily fish such as herring, salmon, sardines, mackerel and anchovies are bursting with Omega-3 fatty acids. Omega-3 does wonders for your pet's skin, coat and brain as well as suppressing inflammatory processes that can cause arthritic pain and other chronic dietary conditions. (If your dog, cat or any other animal has any of these conditions, ask your vet if fish oil in capsule form might help too.) All fish are an excellent source of protein, with many essential vitamins and minerals for great vision. Japanese, Chinese and Korean food uses lots of nori and seaweed as they are packed with protein, vitamins B, C and E, zinc and copper. There are other health benefits too such as regulating metabolism and increasing our immune system. Make sure the nori and seaweed is low in sodium. The seeds of this traditional grain from Mesoamerica have several of the same benefits as the more well-known "super seed" flax. Chia seeds are abundant in fibre, omega fatty acids, protein, calcium and antioxidants. Unlike flax seed, chia seeds don't need grinding in order for your dog to feel the benefit in their eyesight. Chia seeds can be simply sprinkled on their meals. Commonly considered a grain, quinoa (pronounced keen-wa) is actually a seed related to spinach and contains all eight of the essential amino acids as well as being a good source of fibre, folate, magnesium, iron and phosphorus. Quinoa is a potent antioxidant for dogs with diabetes. The good bacteria in yogurt (known as probiotics) help to improve not only our gut function but they are also essential for our general health and good eyesight. Numerous essential minerals and vitamins can be found in yogurt such as calcium, phosphorus, potassium, iodine and vitamin B12. Fresh or frozen blueberries are packed with vitamins C and E as well as an abundance of antioxidants which means they are rated the best dietary supplement for humans and dogs to ensure good vision. However, introduce them slowly into your dog's diet as too many can adversely affect canine and human bowel movements. A friend recommended Ethos Heaven to me when I told her my dog's eyesight seemed to be failing. At 10 years old, I thought it was a symptom of old age, but I wanted to do as much as possible for Pancho so I got in touch and ordered a treatment of their Bright Eyes. I have to say that there is a renewed spring in his step as though a curtain has been drawn back from in front of his eyes. He deserves the best possible treatment as he has been a true friend. If he could speak, I'm sure he would say thank you. I did not notice that my dog's left eye was becoming more dull at first. Since I noticed, I was talking to friends who know about a company that was selling eye drops which seemed to be working for dogs and people whose eyes were not as good as before. I placed an order which arrived in Turin very quickly. I have been using the eye drops on Fredo for four weeks now and the left eye has certainly become more clear. Many thanks for Ethos Heaven Bright Eyes. I was knowing that diabetes sometimes causes eye problems so when my Alsatian, Rex, was told to me that he had diabetes, I was thinking I should look at products to help protect his eyes before anything happened. I found Ethos Heaven online and bought their Bright Eyes. To date, not only is his diabetes under control but there has been nothing bad happening to his eyes. I am hoping for many more years like this. Sorry for my English but I had to say thank you. Cats have a mind of their own and even in winter, my Chloe goes out and stays out overnight. She came back one morning to feed and I noticed she was blinking quickly. I was not sure whether she had a problem in the night but I decided to get something to treat on her eyes. I found Bright Eyes by Ethos Heaven and the order arrived just a few days after I was placing it. She has certainly got better and she doe not mind me applying the drops so they certainly cannot be hurting her. She is out again now, but she always comes home. The vet told me my pony, Jessie, needed an operation because she was developing a cataract in her left eye. I was happy to pay for it but decided to do some research in case there was another alternative. I did not say that to the vet but I found Ethos Heaven and decided to give Bright Eyes a try. Her eye seems perfectly clear now so I have saved all that money and helped Jessie for myself, along with Ethos Heaven of course. Thanks to everyone there. Hi Ethos, Skeeter my miniature pinscher is over fifteen years of age and still going strong despite being deaf and his near complete blindness due to retinal degeneration and cataracts. As a vet I knew that if the retina is degenerating then cataract removal would provide only temporary improvement at best and may actually accelerate the retinal degeneration, due to additional sunlight reaching the retina or inner eye, without the lens. When Skeeter started developing cataracts, I had him evaluated by two pet ophthalmologists. Both related that indeed Skeeter had retinal degeneration and cataract surgery would not result in any improvement beyond a few months at best. They determined he had no vision in his left eye and maybe 10% vision in his right eye. His vision at night was extremely poor. They then recommended Ethos Bright eye drops product for his right eye. Although skeptical, that the eye drops would diminish the progression of the cataract, let alone improve the eye I went to my local pharmacy to purchase the drops. After driving to six pharmacists who had no idea how to obtain the drops I went on the internet to learn more and to hopefully purchase the drops. The eye drops had to be ordered from Ethos Heaven.Despite my skepticism I thought how could I let Skeeter, my constant companion for over 15 years simply go blind, without trying. I ordered the drops and started medicating him with one drop twice a day. At first I did not see any improvement and almost ceased using the drops, but thought I would give it another few months. Then I began to notice that the left cataract was becoming much more pronounced with that white denseness taking over most of his eye, while the right eye was not progressing. I noticed he was seeing better also, especially a little at night. As a veterinarian I want to let you know that I am now recommending Ethos Bright Eye for the treatment of canine cataracts. After applying Bright eye drops to the my 15 year old miniacher pinscher, "Skeeter", for one year, the cataract in his right eye has diminished! I have come to the conclusion that your cataract eye drops are a modern scientific miracle for our pets. From my observations it has prevented Skeeter from going blind and improved his overall aging experience! If your pet has cataracts ask your veterinarian or a pet ophthalmologist about this amazing product. I purchased the Ethos Bright Eye drops for my 10 yr old standard poodle Missy and have been applying the drops for a little over 3 months. Amazingly her eyes are now clear it has been a truly incredible experience to watch. She is more like her old self with renewed confidence and enthusiasm for life. Also our Vet was extremely impressed with Missy's improvements. We cannot begin to thank you enough for this incredible product. Our German Shepherd dog's later years took a turn for the worst when he began to develop cataracts in both eyes. Bright Eyes eye drops, over a period of several months, actually shrank the cataracts to the point of complete clarity in one eye, and almost the same in the other before he passed away aged 15. We are very grateful that we found such an effective, readily-available product which helped Teddy to enjoy good eyesight again during his last days. We have recommended Bright Eyes to others whose pets have cataracts, and we would not hesitate to use it again if our current pet Louie should need it. My dog, a poodle, unfortunately developed diabetes about 2 years ago. Our vet tried a number of different treatment and after a few months of treatment, regulated diet and exercise we managed to get the diabetes under control. Poodles are prone to developing diabetes and we soon found out they are also prone to cataracts as our lovely girl starting showing signs of one in her left eye. The vets along with her diabetes treatment, started treatments for her cataracts however it developed so quickly she soon had poor sight in both eyes. As she was still young, the vets tried a lot to help her but every time we had a new or stronger prescription it would seem to improve for the first few days and then get worse again. We got to the point where we were running out of options when a friend found bright eyes cataract eye drops and though we would have one more go. When the product arrived I was sceptical since nothing else has previously worked, however I was thrilled to find that after a few weeks of application my little girl's eyes started to clear slightly. It took us 2 months of treatment due to how severe her cataracts were nearly gone. Of course we will have to have check-ups every few months as cataracts can easily return but I couldn't have wished for a better treatment, I only wish we had done this earlier so it didn't get so severe. I can't thank you enough both from me and my little girl for saving her eyes. I have a cat called tinkles who is the cheekiest and funniest cat around! He's like another child to me and my husband so we were extremely worried when we noticed his eye one day looking cloudy. Over the new few weeks it got very white and we took him to the vets who quickly diagnosed it as a cataract. I had never known one on a cat before but after I researched it I found it to be quite common. The vet offered us a 2 month course of eye drops and medicine that would have totalled about $5000, money that we just didn't have at that time. 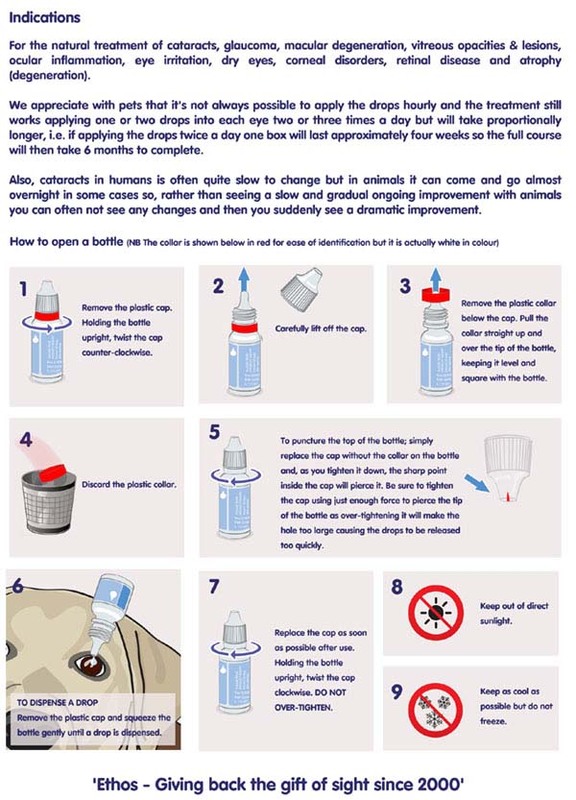 Whilst I was researching I came across bright eyes cataract drops for animals. They were so much cheaper than what the vet was suggesting so we decided to try them. Tinkles himself hated us putting them in bless him but they were easy enough to apply without too much hassle and stress for him. We had to wait about a month before we noticed a difference but it was a considerable difference in the colour of his eye. We returned to the vets who was surprised that we had found an alternative treatment that had worked so well! We even bought extra in case it returns! Our kitten got a cataract we were surprised because it is rare in such young animals but we found bright eyes cataract drops and it cleared up soon enough. My horse, a four year old Appaloosa that I rescued started to get a very glossy looking eye. I knew it was something to worry about so called a vet when it started to get worse. The vet came and said it was a cataracts, he also said that the only option was an operation as it was very advanced. 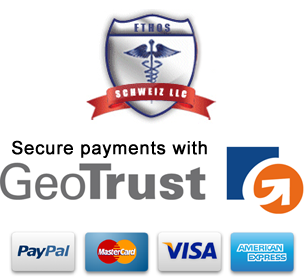 The call out fee alone was $350 and he said that the operation could anywhere up to $8,000 depending on where the operation was done, any complications and aftercare. I was in despair, there was no way I could find that kind of money and there was a risk of permanent damage to the eye which would affect him a lot. A friend told me about bright eye cataract drops because she had used them. It was great to see in just 4 weeks the colour started to come back to his eye and he was getting more like his old self. My border collie developed cataracts in both eyes and the only option the vet gave us was a very expensive operation that we couldn't afford! After I found the bright eyes cataract drops I tried them and after 3 months of daily use he is pretty much back to himself. He had nearly lost all of his sight and now the only time he struggles is in dim light or in the dark. Please regard our name as an endorsement of Bright Eyes, and pass on our recommendation of the product. If Teddy could talk, his comments would be obvious! Kind Regards, Brian Gillis. The vet diagnosed my dog which is a pedigree Bichon Frise with glaucoma and prescribed him this glaucoma treatment and for 9 months there was no improvement. I switched to using the Bright Eyes drops and in the last 3 weeks his vision is better and improving daily. The Bright Eyes cataract drops for dogs are working very well for on our Jack Russell . She had really bad cataracts which completely covered her eyes. Now were slowly starting to see the colours in her eyes come back. Poppy starting to be her normal self chasing the other dog around the garden which she wasn't able to do before when her cataracts were really bad. Thankfully, finally she able to see much clearer now thanks to Ethos Bright Eyes. These drops have made a huge improvement to her life and vision. Bit pricey but great customer service. My 12 year old Labrador is now able to run up and down steps which wasn't an option prior to using the Bright Eyes cataract drops. Thanks to these drops he is now able to see much clearer so we decided to start using them too and it seems to be working. Before using these Cataract drops my dog was unable to get out of the car or walk down the stairs without bumping into things and her eyes were very cloudy. But now her eyes are looking much darker and she is able to walk around much easier than before. I am so thankful that i found Ethos Cataract Eye Drops for my horse. 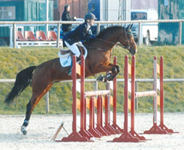 He started showing signs of not being well when we were out showjumping and i did some research online, after finding this product my horse could perform correctly and is perfectly happy with focusing on the jumps ahead and shows no signs of having any problem. Can highly recommend this product to anyone with an animal suffering from this condition. Our Lhsas Apso is 9 years old and developed cataracts. We took her to our regular vet who confirmed that it was cataracts but said it required a series of liver function tests. These tests cost approx £400, although our insurers, Tesco, paid. After the tests we were told we would be refered to a specialist vet for surgery. We decided to phone these specialists to find out the costs involved and were told that this was between £5,000 and £7,000, and included re-doing the tests again as they would not accept the first tests. We spoke to Tesco and they said we were only covered for £2,500, of which we had already spent £400. As we were unable to cover any difference we thought our pet would have to continue to suffer. She was unable to get down the stairs unaided and bumbed into garden pots and household furniture. We then explored the internet and found Ethos Eye Drops. The cost of these were only a small percentage of surgery costs, but never the less we spoke to Tesco to see if they were covered and were told yes. We bought the first pack (2 bottles) and started to apply. Within 2 weeks we believed they were making a difference so bought another pack and continued the treatment. Slowly but surely we noticed a difference, with our dog coming straight downstairs 8 out of 10 times, and fewer accidents. At this point we claimed from Tesco, but were told they were not covered as the vet had not prescribed them. We told Tesco we had received the go ahead from them and after listening to the recorded call agreed. They said they would pay for any drops brought prior to that day. This covered us for 4 packs in total. Time has moved on and the drops continue to make a difference. By the time we have finished the 4 packs we believe that although the cataracts will not have disappeared the dogs life will be massively improved without the expensive and risky surgery. For any owner, finding themselves in our position, speak to your vet and if they prescribe the drops I'm sure Tesco, and other insurers, will pay out on insurance, but please check beforehand. We believe that these drops do work and we are learning all the time about how best to apply. When the 4 packs are completed we will monitor the eyes and consider more, if required. I have a boxer dog called Poppet. She is now 11 years old. Boxers have a tendency towards eye problems because of the bulging nature of their eyes and because they are stupid and don't quite get the concept that they can actually go round things! A few years ago, Poppet had a corneal ulcer in her eye. These are awful as the ulcer eats into the eye and they are incredibly painful. Coventional treatment involves eye drops and scraping the edges of the ulcer to encourage new cell growth (a simplistic explanation) If this fails, which it frequently dose, the next stage involves sewing the eye shut in the hope that the eye heals behind the lid, Unfotunately, the healing process (if any) cannot be monitored as the eye is sealed shut- usually for a few weeks. Poppet went through all these stages and, luckily, her eye did heal because the last option is removal of the eye. Obviously, this was all extremely traumatic for her and three weeks with a boxer in a Buster collar is no joke! Scraped walls, things knocked flying and a plastic cone which nicely fills up with boxer slobber! All good but then, after a while, she got another ulcer in the other eye. This one was much worse and the eye drops from the vet seemed to burn the eye and the scraping was so painful for Poppet. At the point when the vet said she wanted to stitch up the eye, I decided to do some research and discovered your site. After a lengthy telephone conversation, I decided to give the Re-vital eyes drops a go. Well, I am pleased to say that the ulcer has gone without any vet intervention. There is some scar tissue but the ulcer has definitely healed. Whereas I was putting the drops in frequently throughout the day, now I do them morning and night as maintenance. Poppet still gets very bloodshot eyes, particularly when tired, but when that happens I just put the drops in more often. The drops are not cheap but neither are vets and, at the end of the day, I just wanted Poppet to be well. I really recommend that people give the drops a try- have a bit of faith! I don't care why they work or what's in them- they work!! My mother (85 years old) now has them do for her streaming eyes so watch this space! "Bright Eyes Drops for Pets IT WORKS!" My dog started to get cataracts in his eyes. He was starting to walk into things and not being able to see to play catch without getting hit in the head with the ball. You could see him starting to give up and not wanting to play much anymore. Being in the medical field I knew that there was not much that could be done and he would eventually go blind and surgery would not only cost a small fortune but could possibly cost my pet his life which would be devastating to our family. But being the person I am I started researching alternative solutions (if any) and came across Ethos Bright Eyes Cataract Drops for Pets. After reading Testimonials and watching the video on this product I decided to give it a try. I have just finished the 4th bottle and have seen a significant improvement in my pets eyes. My pet is now up and about playing like he used to when he was a puppy. He still has a bit of trouble in darker surroundings but he is much happier and full of life again! I would highly recommend Ethos Bright Eye Cataract Drops for pets. "Zoe the French Poodle Regains Her Sight!" "IT'S A MIRACLE My Beautiful dog 'Faith' can see again! " It is estimated that more than 17 million households in the UK own a dog or a cat. We are a nation of pet lovers but as pet's age, they are just as susceptible to health problems as we are. It is a natural cause of worry and expense. Cataracts are the most common cause of blindness in dogs. As a dog gets older it is highly likely it will develop some form of eye problem. At Ethos Heaven we recommend that you should have your pet checked over at the slightest sign of any discolouration of their eyes; this could mean that a cataract may be developing. There is nothing wrong in having routine checks even if you have not observed any problems. The risk of surgery increases as you pet gets older and cataracts are more likely to develop with age. As your pet gets older their immune system decreases, he or she becomes more prone to diabetes and heart disease. These health problems can really increase the risks when an animal has an anaesthetic and can mean your pet can take a lot longer to recover from the operation.? When Ethos Heaven developed a cataract treatment for pets in 2000, it removed the absolute need for surgery. Ethos Bright Eyes Cataract Drops for Pets has an improvement rate of almost 80% in maintaining good eye health in animals. The formula was originally tested on people to treat cataracts, AMD and glaucoma and has been a massive worldwide success. It is recommended that a full course of 6 boxes for both eyes will last between 6-8 weeks. In this time period, cataracts are expected to shrink/dissolve or as an absolute minimum you will see sight improve. If your pet or animal have more mature cataracts, it could take slightly longer. That would mean more boxes, but equally if the cataracts are not so severe it could take less.